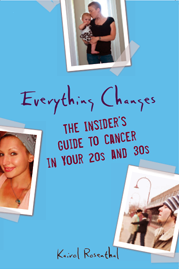 Everything Changes – The Guide to Young Adult Cancer » Wanna Be In Pictures? As I clacked away at my computer today, photographer Andrew Young set up big, umbrella-like lighting devices and shot pictures of me at work. He is creating a book of photos of and essays by cancer survivors. It was about as close as I will ever get to pretending that I am on America’s Next Top Model. If this sounds like fun to you, meet Bill Aron. Bill is 67. He is a prostate cancer survivor and another professional photographer seeking survivors to shoot for his new book Beyond Cancer. Bill had a disease that not many young adults have, and is writing a book that is not specifically about young adults. So why am I sharing with you his request? Because he actually cares about young adult cancer and not many people do. Not many books, organizations, or cancer services take a step back, look at the big picture and say, “Gee, there’s a black hole were 20 and 30-something cancer patients should be represented.” I love that Bill gets it. I love that he wants us in his book. If you are interested in participating, contact Bill (bill@billaron.com). He lives in Southern California, but will be traveling as part of the project. This week is Everybody Wants You Week on my blog. If you are a patient, what does it feel like to have people soliciting you for studies, interviews, photographs? Does it feel like a great opportunity to shine, to use your experiences for good? Or, are you tired of feeling like a creature on display? uugghh. I battle with this back and forth. Sometimes I just despise even talking about cancer. Although naturally I know that most people who talk to me these days want to know whats going on. I have to catch myself. But in the same vein I enjoy being able to help someone out who is feeling the same isolated feelings I was initially (and still do). So, its a toss up for me. A love/hate relationship you could say.